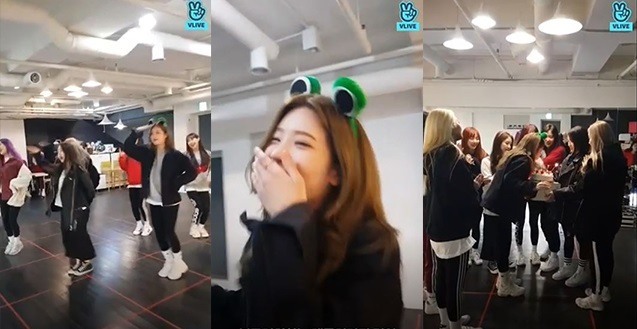 The Korean girl group Loona uploaded a video on V Live on Tuesday afternoon, showing fans a surprise birthday celebration for Kim Lip on Sunday in its practice room. While conversing with fans in real time, Kim’s bandmates asked her to dance to their songs “Heart Attack” and “Kiss Later.” She couldn’t refuse, of course, because it was a birthday request. In the video, Kim wore a frog hairband as she showed off her lively dance moves. Her bandmates all danced with her before surprising her with a birthday cake. “We plan to air V Live often like this and we also have only a few days left till our concert. So please stay tuned and keep supporting us,” all the members said together at the end. Loona is preparing to release a repackaged album, “Multiple Multiple,” consisting of 12 songs including title track “Butterfly” and five other new songs. The K-pop group will perform the songs during its second solo concert, “Loonaverse,” Feb. 16-17 at Olympic Hall in Seoul’s Olympic Park. Watch the video at https://www.vlive.tv/video/112735?channelCode=F021E1.